Writing The Simpsons has a built-in safety net. Sadly, it’s also got a built-in handicap that brings writers more or less back to square one. On the plus side, these characters are so well established and—dull internet snark aside—beloved, that fans bring a lot of good will and knowledge to them right at the starting line of a particular episode. Such a circumstance might suggest that all the writers have to do is not screw up in order to keep that goodwill. Unfortunately for those writers (and we’ll get to a very important one in a minute) all that awareness carries not only a quarter-century of expectation but also more than a decade of extremely (and, yes, understandably) lowered expectations, plus the pervading opinion that everything that can be done with these characters and their possible conflicts, jokes, and adventures has been done. Marge and Lisa have a fight in the first act of “How Lisa Got Her Marge Back.” Which means they’re going to make up by the end of the episode, and, in true fashion of not only The Simpsons but most sitcoms ever made, that fight is not going to affect their relationship in any appreciable way going forward. I’ve always maintained that that’s not a problem in itself—The Simpsons can go on as long as these actors’ voices and Fox’s largesse hold out because, not in spite of, the show’s weekly-rewritten reality. It’s an endlessly renewable resource where good writers can play out these characters’ stories—silly, emotional, or any combination thereof—again and again. It’s all in how it’s written. 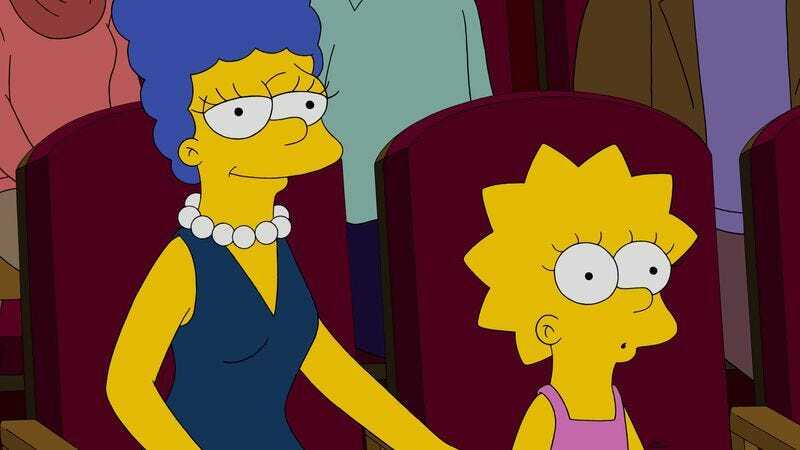 Here, Marge and Lisa’s conflict stems from a painful truth kids have to learn about their parents—and parents have to admit to themselves—which provides a solid emotional core. Lisa, after spending a long 12 minutes of her mom’s typically harried morning playing her newest jazz solo (“My Funny Valentine,” not that Marge can figure that out), overhears the always forbearing Marge peevishly admit to Homer that not only does she hate jazz, but that she’s bored to tears by Lisa’s playing of it. Lisa actually swoons unseen at the top of the Simpsons’ staircase at the revelation, her bafflement at her mother’s words turned to crushing certainty when Santa’s Little Helper’s stray tootle at her sax elicits an enthusiastic “Sounds great, honey!” from Marge downstairs. Conflict among the Simpson family lands hardest when it’s born of that kind of relatable truth—an inevitable yet inconceivable realization of one of the disillusionments that come with family relationships. And this is a crusher, both for Lisa and for Marge. At first, Marge is obviously in the wrong—but only because she accidentally let slip something that she knows Lisa should have figured out on her own as part of the process of growing up. Later, when her planned makeup trip to Capital City with Lisa won’t melt her daughter’s resentment, Marge can only break down and weep, her initial anger at Lisa’s pissy vindictiveness melting in a puddle of self-awareness as she sobs, “You’ll have a daughter someday too. And when she yells at you—she’ll be right.” Lisa, too—after successfully steeling herself against her mother’s tears—finally melts, her conversation with guest star Andrew Rannells (doing some decent self parody as a dickish egomaniac) making her realize not only that her mom feels terrible for slipping up so badly, but that there’s value in Marge’s optimism (and even her more lowbrow, mom-specific tastes). It’s sweet, but not overly simplistic about it, Marge’s heartfelt mea culpa, “And I apologize for expressing my sincere feelings,” just the right sort of self-aware to bring the Marge-Lisa relationship back into balance. The best Simpsons resolutions contain that core of existential darkness—I’m thinking of Homer’s “To alcohol! The cause of, and solution to, all of life’s problems”—where just keeping going as a human requires making accommodation for the attendant compromises. Which is a bummer, since “How Lisa Got Her Marge Back” marks the return of writer Jeff Martin (his first script since 1993’s “Homer’s Barbershop Quartet”). 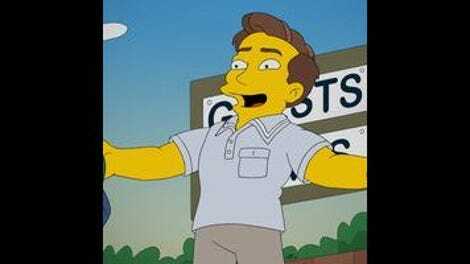 Not only did he write that classic, music-heavy episode, but he’s also credited with perhaps the greatest Simpsons musical theater bit of all, “Oh, Streetcar!” from 1992’s “A Streetcar Named Marge.” (You’re singing “Can’t you hear me yell-a? You’re puttin me through hell-a” right now, I know it.) All the Broadway stuff here isn’t of that caliber which, again, bummer. (Yeardley Smith getting to belt out a full-throated rendition of “Don’t Rain On My Parade” from Funny Girl is adorable, if not the transcendent Lisa moment it tries to be.) But still, it does provide a nice human foundation for the Marge-Lisa story. Marge would love the uncomplicatedly pleasant musicianship of jukebox musicals and the likes of Paul Blart: Mall Cop: The Musical (all he really needs is love, you guys), just as the more aspirational Lisa would find it the equivalent of Kenny G playing jazz saxophone. As she puts it to herself before forgiving Marge, “Hardly anybody likes jazz. Why should I expect my mom to?” When they have that inevitable hug, they both learn something and learn that there’s nothing to be done about what they’ve learned, which is about as realistic a resolution as you get in a family. The B-story is fine, with Bart adopting Maggie as his prank-pal once he realizes that all his Chinese-made novelty items have lost their power to shock and amuse. There’s not much to it, but the two make a cute team, as Bart—often endangering his toddler sister’s life in the process—tricks Rod and Todd into thinking she’s an angel, sneaks her onto a roller coaster, and pranks ol’ Gil into thinking he’s shattered her to pieces. It’s fine. Marge’s initial antagonist role gets deconstructed nicely, but her line about Lisa, “That’ll calm down that little yellow pill,” is pretty off-brand mean-spirited for Marge. I don’t know why Lisa would be such a fan of the original The Bad News Bears (maybe the strong female lead) but her meta-joke (“Is there nothing so beautiful that they won’t keep exploiting ’til its worthless?”) over a subtitle advertising Simpsons DVDs got a laugh. I think that’s Dan Castellaneta doing the voice of the Walter Matthau/Buttermaker angle in Rannells’ Bad News Bears show.